Keeping it simple. If it runs on rails it qualifies, providing it was taken on a Pentax camera or a Pentax clone. A good selection of images this week which has not made judging easy so here goes. 1. Locomotive Detail - tyronet2000. A classic shot concentrating on the driving wheels of the locomotive. It is sharp throughout showing plenty of detail. There is nothing distracting in the image. It oozes the feeling of power. A picture of two halves. The train and the empty platform. It needed more train and less platform. The back view of anything is rarely the best and although in a lovely spot this image does not do justice to the vintage train. The loco has been well captured, a good angle with lots of detail. The people on the RHS near the edge are distracting and the white key line clips the LHS rail. 5. Class 1500 Street Car - smudge. The tram is sharp with lots of detail and stands out well from the background buildings. However again it is travelling away and would be stronger travelling toward the camera with the driver in view. 6. Flying Scotsman - vic cross. Always good to see the 'Scotsman at speed and you have captured that aspect well. However the viewpoint wasn't ideal. May be better as a portrait image loosing most of the distracting greens. An interesting shot showing the way things used to be on the docks ( if you can imagine it without the people} The prominent sign at the front is very distracting. A lovely day at the NYMR with the sun just in the right spot to light up the engines. The two engines work well together. The people on the left are a distraction and a little too much space on the right. This is the same location as Perspicador but this time the train is facing the camera and what a difference it makes. It is sharp throughout giving detail from front to back. The image has a beautiful, tranquil feel. Almost but not quite. 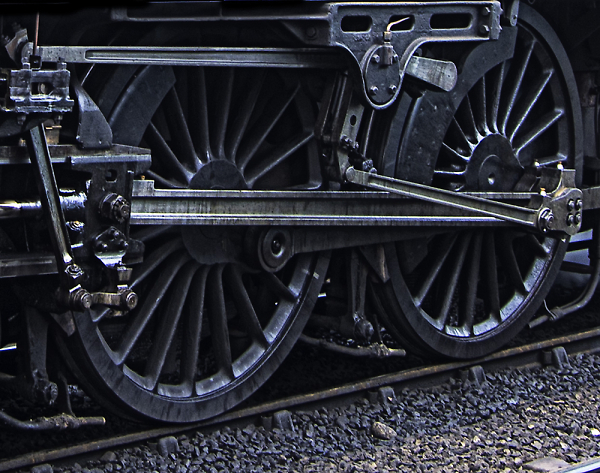 If it hadn't been cropped so tightly, loosing the RHS of the loco, then it may have been among the best. A good attempt at something different. However nothing in the image is sharp. I can't fathom out how you 'stopped' the train with a 4 sec exposure! This dock scene contrasts the old warehouse, now converted to modern apartments, with the old crane .The jaunty angle at which the image was taken gives the jib and the building opposing diagonals which I think works to give quite a dynamic image. This shows the tram well in its working enviroment and the mono conversion has been well handled. However the light is coming from the wrong direction leaving most of the tram in shade with very little detail showing. I think the image would have been stronger if the train had reached the crown of the bend and the wall at the top cropped out. Yes, A pint on the right lines. I wonder if they still use glass? The barman's arm on the left and the part person on the right are distracting. This puts the line in context with its scenic setting but the train is too small in the frame and is overpowered by all those distracting yachts in the foreground. 1st. Locomotive Detail - tyronet2000. So simple but with so much detail, no distractions and such a feeling of power. 2nd. Water Stop - davidtrout. A beautifully photographed tranquil scene. 3rd. Black 5 Loco 44806 - JAC. An excellent view of the locomotive. Thank you for electing me as the Winner in this competition. Very Well Done to the other podium places. Thanks to noelm for the interesting subject the judging and the comprehensive comments. Will set the next competition asap. Congratulations to Stan.... and the rest.... fun competition, thanks. then realised it was shot on the Fuji 4800 that preceeded my return to Pentax with the *istD. and there weren't enough pixels left to play with!! Well done Stan and thanks to Noel for the competition and considered comments. Thanks for my 2nd place and also to 3rd placed JAK for his excellent photo of a Black 5 at Pickering. Also well done to the HMs, John Riley and NigelK. Well done noelm for the competition and thoughtful judging. Thanks for the spot on the podium! Well done to Stan for his winning shot and davidtrout for his second place. Well done for the rest of the very fine entries too. To me the people were there and are an important part of the picture - they're the ones who the trains are run for. No passengers = no trains! Ooops! Sorry JAK, Won't make that mistake again. It was getting late. Congrats Stan, as noted, that image speaks of a lot of power! Great shot! And extended to Davidtrout and JAK, and not forgetting the HM;s John Riley and nigelk. Fine challenge and thanks to our Judge for the C&C's, as always appreciated. Funny, I had originally cropped out the wall, but did not like it at all, and left just a little for context!